Tyson Rua has more than his fair share of problems growing up in South Auckland. Working a night job to support his mother and helping bring up his two younger brothers is just the half of it. His best friend Rawiri is falling afoul of a broken home, and now Tyson’s fallen in love at first sight. Only thing is, it’s another guy. Living life on the sidelines of the local hip-hop scene, Tyson finds that to succeed in becoming a local graffiti artist or in getting the man of his dreams, he’s going to have to get a whole lot more involved. And that means more problems. The least of which is the leader of the local rap crew he’s found himself running with. Love, life, and hip-hop never do things by half. When I saw this title up for grabs on NetGalley, I immediately went for it, and thankfully my fervent enthusiasm was received warmly, and so I’ve gotten the chance to read this marvelous novel some good months before its release. As I’ve come to see in some cases, that’s both a good and a bad thing, and I’ll start with the good: having the chance to read a great book considerably sooner then the rest of the public is and always will be a great bookish joy for us book addicts; the bad part, however, is that you might get to read a pre-edit review copy, like this was the case, and that means you’re reading a working progress most likely. Sometimes it makes the difference between one rating and another, as this was the case. What I want to say right of the bat is this might just be the most diverse and urban-style beautiful young adult novel I have yet had the pleasure to read. It’s also the only young adult novel I’ve read where the main character is something else then a “popular type” having a love interest of the same type; why not just come right out and say it though, right, this is the only young adult novel I’ve read so far that has a gay guy as main character, and a maori to boot. It’s my strong and unwavering opinion the world of books needs a lot more of these babies, a lot more diversity and courageous writing as opposed to following some generally accepted recipes that end up making novels into mass products instead of unique, original voices. 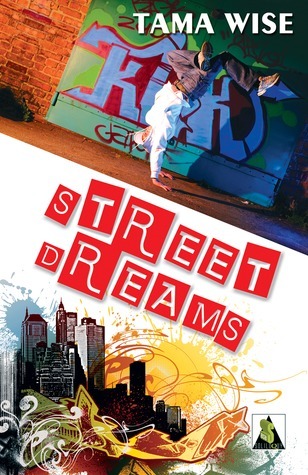 Street Dreams is an original. It’s gutsy, different, and disarmingly beautiful in many, many ways. The story is absolutely heart-wrenching, I mean I was reading with a quivering lower lip something like half of the novel, sobbing in a few key points and then smiling by the end. It was maybe the first time in a long while when reading a book I hadn’t the vaguest about where it was going to take me, and aside my emotional turmoil over Ty’s destiny, and Rawiri’s as well I will add, I didn’t much care where the story would take me, I was on board like my life depended on it. The atmosphere was amazing, beautifully urban, with hip-hop dudes, slang, and some graffiti artistry going on, egos the size of the Titanic, poverty, abuse, confusion, desolation…honestly, I can’t think of one emotion on the map that wasn’t in there. Ty was amazing, and he’s totally my favorite character right now; he’s so conflicted about his identity, so eager to discover himself and yet so frightened of falling under the “different” stigma, he’s brave, hardworking, and yet he feels so lonely in his rather grim life…perhaps that’s how we all feel at times, hm? Having a troubled best friend with a dramatic life story, missing his deceased father and coming to terms with who he really is and what he really desires, Tyson struggles to always save the day for everyone, he’s a little hero for everyone around while he crawls through his own issues all by himself. I cannot begin to tell you how many times I had the impulse to jump into that novel and just give him a hug, tell him it will be OK, that things will eventually turn for the better but right now he needs to put up with the worse. There were moments when even I gave up hope and started thinking maybe this amazing young man won’t find the happiness he’d deserve, and that was almost crushing; I kept getting my hopes up right alongside Ty and I cried when they were crushed, even when he didn’t cry himself. My second favorite character of the novel, and really high up on my all-time favs list is Ihaia, for a purely selfish and personal reason of course, which is the man has the same world view as I do, and I’m thoroughly delighted each time I find a kindred spirit; what’s his policy? I’m not big on labels, I just know what or whom I like and go for it regardless of what other people might think or say about it, basically, and I wanna give the man 1000 thumbs up, that’s the way to live! I loved that about him, I loved how he treated Ty from the very first time they met, I loved how he stuck by what he believed and was there to man up when he was needed, the dude was pretty much fearless. Marc was a really cool character as well, and I really liked him too. Zadie was cool but she annoyed me at times, mostly because I was in the loop with what was going on with Ty so her fussing over him sort of grated on my nerves, and I know it’s bad of me to have that reaction to her care, but there you have it. I would like to say that this novel also brought on a rare situation for me, though I will almost always dislike one or more characters in a novel, it’s rare that I really dislike someone with a passion, but man, I was ready to poke that bozo Siege’s eyes out with a spear or something, seriously. I kept picturing all these really nasty things that I’d just loved to happen to him almost from the first moment he made an entrance in the story. Of course, a better person would have given him a pitiful stare, feeling mercy for his limited brain power and seriously impaired love and understanding capacity. Maybe someday I’ll be that evolved, but right now, that type of person just makes me want to throw them a bone – in the head. So then, if I looooved the characters, loooved the plot and all, why isn’t this a 5 butterflies read? Well…I feel sort of bad to say this, but I’m always honest with you guys about my reading experience and I won’t quit doing that. The writing felt like it was pre-edit, there, I’ve said it. We’re not talking typos or obvious stuff like that, more like the flow of the prose, you know? I mean, it felt like the phrasing could have been more cursive in a few places. That’s how I felt. I’ll love to see the finished product, to make sure there’s nothing keeping me back from giving it a full on 5 butterflies. I cannot encourage you strongly enough to read this novel, it’s a rare beauty, amazingly original mix of awesome-sauce elements, lovely characters, fresh and exciting plot, a strong and powerful message, it’s a must read if you ask me. Celebrate and embrace diversity, guys, it’s a blessing.